﻿﻿﻿﻿﻿Skeleton shrimp lurk in the shallows off the Texas coast. ﻿﻿﻿﻿Ever find yourself jumping in your seat when a fascinating yet horrible monster pops out on the movie screen? Even though you cover your eyes, you still venture a peek between fingers to get another glimpse. Real animals often serve as models for some of Hollywood’s scariest inventions. It wouldn’t be surprising if a certain type of amphipod — small crustaceans found along the Texas coast — inspired man-eating aliens in a series of blockbusters. Even its name is scary: skeleton shrimp. Skeleton shrimp, a small, unusual group of amphipods, are not really shrimp at all. Shrimp have 10 pairs of legs, but most amphipods have only seven (certain skeleton shrimp have as few as five). With a long, stick-like body and large claw-like appendages (gnathopods), skeleton shrimp look like the translucent offspring of an aquatic praying mantis and a walking stick. If you want to search Texas beaches for these living monsters, bring a magnifying glass. Of the nine species of skeleton shrimp recorded from Texas coastal waters, the largest are only about one inch long; the smallest, less than a quarter-inch long. 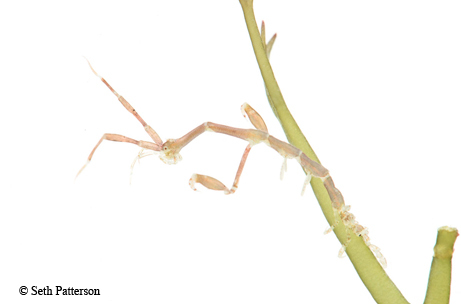 Aside from their small size, skeleton shrimp are masters of disguise. They use their hind legs to grasp onto their favorite substrate, and then allow their bodies, antennae and remaining appendages to wave in the water, blending in like a small piece of algae. They can be found attached to a variety of surfaces, including mangrove roots, eel grass, floating debris and the sargassum that washes up on beaches. Depending on the species, skeleton shrimp feed on a variety of material, including detritus (a mixture of living and dead plant and algal material and microorganisms), plants, algae and small animals, including other skeleton shrimp. Despite their terrifying close-ups, they are much too small to pose any threat to people. When piles of sargassum make fishing on the beach difficult, put down your pole and collect a small bucket of the stuff. Look closely and find the eerie world of skeleton shrimp, perched like their bony namesakes in a forest neighborhood of odd residents. Pull out your magnifying glass or zoom your camera in for a closer look at what might be the next Hollywood monster.